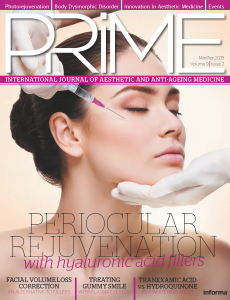 These findings suggest an unmet need in cosmetic offerings to help patients achieve a refreshed appearance and a sense of rejuvenation without the cost, risk, and downtime of major reconstructive surgery. Furthermore, many patients are not eligible for major reconstructive surgery or desire an alternate option, while others may be candidates for combination approaches with laser and injections. Given these conditions, a re-examination of the potential role of suspension suture procedures is warranted, especially because outcomes and safety with modern devices that are entirely dissolvable differ significantly from prior procedures based on using permanent threads. Conceptually, suspension suture procedures function to lift skin, and thus they should be viewed as complementary to the volumising effects of injections, skin tightening properties of laser and energy-based procedures, and the muscle relaxing mechanism of neuromodulators. In this regard, suspension suture procedures help answer patient demand for a procedure that helps achieve a more youthful appearance through an ideal face shape rather than by chasing wrinkles. Re-contouring the face without adding excessive volume is likely to achieve a more naturally youthful look without yielding a worked-on appearance. Thread lift procedures were initially envisioned as a mechanism to lift ptotic skin to help recreate the inverted triangle facial structure associated with a youthful appearance. However, it is important to differentiate the historical precedent in thread procedures from modern techniques using absorbable sutures. A number of thread design options have been offered over previous decades, including free-floating, bidirectionally barbed nonabsorbable threads; unidirectional barbed, nonabsorbable threads; anchored, bidirectional, nonabsorbable double-threaded threads; and a technology combining a nonabsorbable knotted thread and absorbable cones.3 More recently, improvements in entirely absorbable suture designs have made them a more viable option, providing patients with excellent benefits that last 18 months or longer due to suture absorption and subsequent volumisation. The Silhouette InstaLift (Figure 1) is comprised of two components: sutures composed entirely of poly-L lactic acid (PLLA), and cones that are 82% PLLA and 18% poly lactic-co-glycolic acid (PLGA). Of note, PLLA has been used in medical devices for decades. 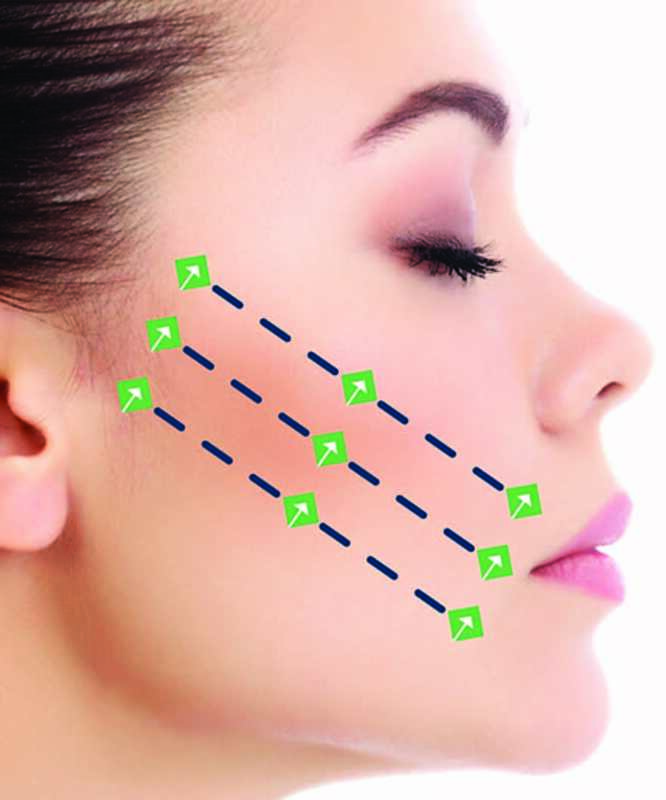 The degradation ratio of PLLA is known to be much slower compared with other suture materials, and so the benefits are expected to last longer.The InstaLift procedure is the only available nonsurgical technique indicated for repositioning of facial tissue in the midface, although successful results have also been noted in the jowl, jawline, and neck (note, these would be considered off-label use).16 Suture placement and anchoring of the cones in an immediately subdermal glide plane17 positions the cones, each of which is designed with a smooth 360° surface, to engage and lift descended tissue at the retaining ligament and subcutaneous fat level (Figure 2). Inevitable absorption of the suture material reduces the lifting effect; however, the breakdown of polylactic acid results in fibroblast stimulation for neocollagenesis,18,19 thus providing volume in the mid-face to provide a natural looking result that lasts up to 12–18 months.20,21 Importantly, the Silhouette InstaLift procedure differs significantly from thread lifting procedures with which surgeons may be familiar. Prominently, recontouring, rather than a mechanical lift alone, is the primary basis for improvement in the appearance at 12 months and beyond. Histologic studies show that scar tissue progressively forms around the suspension suture from 1 month to 1 year, with reductions in the number of inflammatory cells (i.e., mast cells and lymphocytes) and an increase in collagenous tissue.22 By 6 months collagen deposition and connective tissue formation starts to occur; also around this time, the cone material begins to degrade, and they are completely resorbed by about 12 months thereafter.22 During this time, hyaline fibrous tissue, composed of collagen and elastin fibres, undergoes gradual remodelling until at least 12 months after suture placement.22 These findings were recently confirmed in a study that followed patients for 180 days after an InstaLift procedure in which collagen formation was assessed quantitatively on biopsy samples stained with Picrosirius red. In the study, collagen Type I and III expression progressively increased from Day 1 until study completion.23 Furthermore, the measured increase in subdermal collagen was consistent with both patient-and investigator-reported improvement in skin texture and firmness, suggesting the PLLA within the sutures placed in the subdermal layer helped improve the quality of overlying tissue (Figure 3). 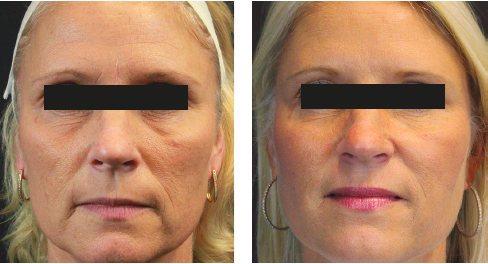 Because it is associated with a lower cost and increased convenience relative to surgery, the InstaLift procedure is appropriate for a broad range of patients, including individuals with mild to moderate skin laxity needing rejuvenation, younger patients who want better malar projection, and patients of any age with asymmetry due to facial palsy and no possibility of functional nerve restoration.4,24-26 Men with receding hairlines whose scars are difficult to hide, patients with a previous facelift procedure who need additional correction, and those who are contraindicated to surgery due to impaired wound healing secondary to hypertension, diabetes mellitus, or tobacco abuse, are also good candidates. The side-effect profile of the InstaLift procedure further differentiates it from invasive surgery. Post-marketing surveillance conducted by the manufacturer indicates an adverse event rate of 0.006%.28 The most commonly reported events include swelling (which may occur after injection of lidocaine and resolves within 2–3 days) and bruising (treatable with icing the area or laser). Discontinuation of blood thinners is discretionary but patients should avoid medically unnecessary supplements that may increase bruising, including vitamin E, garlic, ginger, and ginkgo.26 Although rare, some serious adverse events have been reported, including hypersensitivity, which is treatable with steroids, and postoperative or profuse intraprocedural bleeding, which may be technique dependent. Generally, InstaLift is associated with a very favourable safety profile, and patients infrequently experience pain or discomfort during or after the procedure. Outcomes with the InstaLift procedure have been studied in a number of clinical trials. In a series of 100 patients, 62% had eight cone sutures placed in the midface, 54% had eight cone sutures placed along the jawline, and 33% were treated using 12 cone sutures in the neck.4 Over 90% described the procedure as tolerable and only infrequently associated with discomfort. Satisfaction with the outcome was high (79%), with 83% agreeing that the procedure improved the appearance of ageing. Results from a two-phase study, with initial data analysis after 8-week and a secondary outcome after 12 months of extended follow-up, highlight the dual mechanism associated with the InstaLift procedure.21 After 8 weeks of follow-up, meaningful changes to facial appearance were noted in subject and investigator assessments and validated questionnaires. Perhaps more notable was that significant changes in lifting were demonstrated using the Canfield 3D Vectra M3 face and neck surface imaging system. At the 12-month time point, some degree of lift was still evident in imaging in most patients, although subject and investigator assessments and questionnaire responses indicated a continued perception of positive benefit. Additionally, patients reported a favourable change in skin quality and overall recontouring of their facial structure. 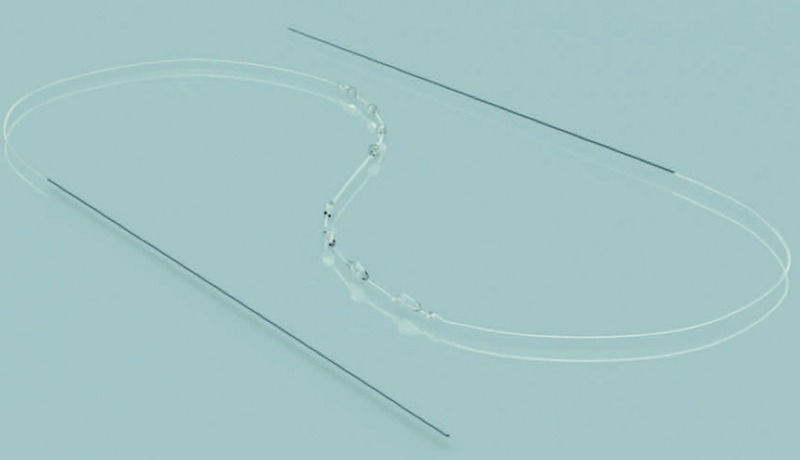 Thread lift procedures using a technology known as Beramendi, which is composed of biocompatible poly-propylene, have been reported.29,30 This device is closely related in design to threads available on the market. Studies to date have included relatively low numbers of patients with minimal follow-up. Nevertheless, investigators have reported generally favourable outcomes, with some reports of ecchymosis, oedema, discomfort, and pain, as well as some incidents of localised depression (dimpling).30 However, the fact that this device has been around for nearly two decades in various iterations of design yet has not been subjected to rigorous clinical trials should provide pause for cosmetic providers. There is no clear evidence at this time to support short- or long-term outcomes with the Beramendi non-surgical procedure, nor has its safety been appropriately verified.Data from studies investigating permanent threads, which are similar to the Beramendi, may be relevant to consider. In one series of 102 patients, reports of complications were common: 11 palpable thread tips with pain, eight thread migrations, five infections or granulomas, and five skin irregularities.9,31 More severe complications, including Stensen duct rupture, facial nerve injury, chronic foreign body sensation, and scarring, have also been reported.32,33 In addition to the medical concerns noted herein, these complications may result in extended downtime and recovery, in some cases comparable to rhytidoplasty, and there is also an appreciable rate of removal or revision associated with use of this device for facial repositioning.Permanent placement of a foreign body also entails inherent risks.34 Above and beyond the potential for unsatisfactory aesthetic benefit, even the most stable material will break down under normal physiologic stress and flexion. Because these procedures are typically performed in younger patients, any fragments can remain for decades, potentially becoming a source of infection. Suspension suture procedures using absorbable threads should be considered a reasonable alternative to rhytidoplasty in appropriately selected patients, able to achieve durable results lasting 12–18 months with a low incidence of complications, rapid recovery, and minimal downtime. However, outcomes from the procedure should be considered distinct from outcomes after invasive surgery. First and foremost, these procedures have different endpoints, and suspension suture procedures by their very nature are designed to be less invasive. Thus, they necessarily avoid significant complications associated with rhytidoplasty, including scarring, prolonged recovery, infection, skin necrosis, haematomas, seromas, and injury to the frontal and marginal branches of the facial nerve.Not all suspension suture devices are equal with respect to durability of response and demonstrated safety and efficacy. Communicating confidence in results is greatly facilitated by the existence of rigorous clinical trial data that confirm positive benefits. Conversely, the shortage of data available with certain devices leaves no clear indication regarding where they fit in the treatment of patients, nor is it clear if they are amenable to or detrimental to use of other forms of facial rejuvenation. In fact, one of the clear points of differentiation with the InstaLift procedure is that there is validated science showing that it can complement the use of neuromodulators, dermal fillers, and energy based technologies to achieve a customised approach to facial repositioning. Fundamentally, the cone-based design of the InstaLift may confer certain advantages relative to barbed absorbable threads. On a mechanical basis, cone designs appear to have greater tensile strength compared with barbs, thus lowering the risk of dimpling, extrusion, or palpability.4 Compared to barbs, cone designs offer greater resistance to slippage and tension profile, thus yielding more sustained elevation after the soft tissue has been set to its new position.35 Additionally, barbed threads provide less resistance to withdrawal relative to cone designs.35 In addition to the tension created by a lifting of the retaining ligament anatomy and various compartments of the face achieved with the suture placement, the shape of the cone also appears to facilitate volumisation after the procedure. As noted above, decomposition of the PLGA cone induces neocollagenesis; the cone shape provides a larger structural support element for that collagen growth compared to a barb, ultimately leading to a smooth, contoured appearance.4,25 Relative to barbed threads, the InstaLift suture is placed deeper in the subcutaneous tissue, which may provide for greater traction resistance while also minimising the risk of becoming palpable or visible.25 At this time, the availability of safe and effective absorbable suture options should preclude the use of permanent thread placement for facial repositioning procedures. The lack of published studies investigating permanent threads is concerning and leaves clinicians without the ability to adequately counsel patients regarding outcomes. Additionally, historical experience with and technical limitations presented by the use of permanent threads should further serve to dissuade their use. 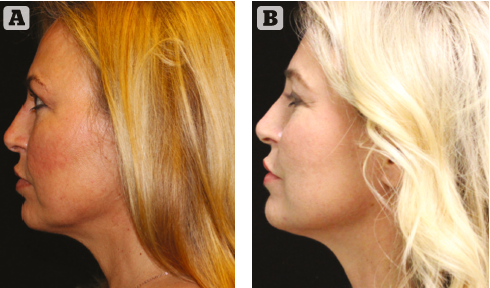 A re-examination of the role of suspension suture procedures is warranted in light of new technologies that offer patients the potential to achieve the more youthful appearance they seek without having to undergo major reconstruction surgery. As with all procedures, patient selection and proper education regarding outcomes are keys to success. The availability of verified data in peer-reviewed published sources should supply additional confidence to clinicians regarding the role of suspension suture procedures. 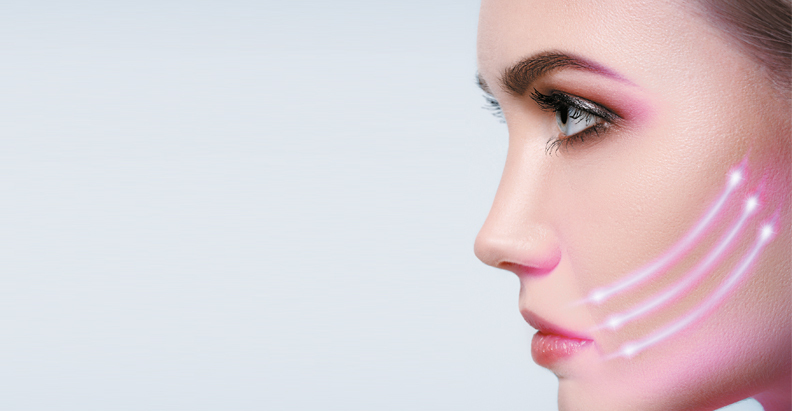 There is clear market demand for minimally invasive options for cosmetic offerings that help to reshape the face and provide volumising effects. The InstaLift technique is a viable option to address this unmet need in appropriately selected patients and is amenable to combination approaches with a laser, injections, and other techniques to improve the appearance of the skin and face. Cosmetic Surgery National Data Bank Statistics. Aesthet Surg J. 2017;37(suppl 2):1-29. ASDS survey: Seven out of ten consumers considering cosmetic procedures. June, 2017. Available at: https://www.asds.net/Medical- Professionals/Practice-Resources/ ASDS-Consumer-Survey-on-Cosmetic- Dermatologic-Procedures. Villa MT, White LE, Alam M, Yoo SS, Walton RL. Barbed sutures: a review of the literature. Plastic and reconstructive surgery. 2008;121(3):102e-108e. Garvey PB, Ricciardelli EJ, Gampper T. Outcomes in threadlift for facial rejuvenation. Annals of plastic surgery. 2009;62(5):482-485.
eNotAlone. Facial Thread-Lift Loses Approval of FDA. Available at: https:// www.enotalone.com/health/19583.html. Accessed August 26, 2018. Plastic Surgeons.com. FDA Approval Status for a Threadlift. 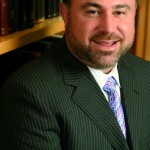 Available at: https://www.plasticsurgeons.com/article/ face/threadlift/fda-approval-status-for-a-threadlift. Accessed August 26, 2018. Instruction Packet—InstaLift. http:// www.instalift.com. Accessed September 5, 2016. Goldberg DJ. Non-barbed Suture Lifting and Neocollagenesis: Why Does the Skin Look Healthier? Presented at the Vegas Cosmetic Surgery Meeting. June 6-10, Las Vegas,NV. Sulamanidze M, Sulamanidze G. APTOS suture lifting methods: 10 years of experience. Clinics in plastic surgery. 2009;36(2):281-306, viii. de Benito J, Pizzamiglio R, Theodorou D, Arvas L. Facial rejuvenation and improvement of malar projection using sutures with absorbable cones: surgical technique and case series. Aesthetic Plast Surg. 2011;35(2):248-253. 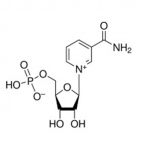 Lorenc ZP, Ablon G, Few J, et al. Expert Consensus on Achieving Optimal Outcomes With Absorbable Suspension Suture Technology for Tissue Repositioning and Facial Recontouring. Journal of drugs in dermatology : JDD. 2018;17(6):647-655. Prospective, masked, controlled feasibility study. Data on file. Sinclair Pharma US. Sinclair Pharma plc. Internal safety report. London, UK: December 2017. Sulamanidze MA, Fournier PF, Paikidze TG, Sulamanidze GM. Removal of facial soft tissue ptosis with special threads. Dermatologic surgery : official publication for American Society for Dermatologic Surgery [et al.]. 2002;28(5):367-371. Badin AZ, Forte MR, OL ES. Scarless mid- and lower face lift. Aesthet Surg J. 2005;25(4):340-347. Wu WT. Barbed sutures in facial rejuvenation. Aesthet Surg J. 2004;24(6):582-587. Helling ER, Okpaku A, Wang PT, Levine RA. Complications of facial suspension sutures. Aesthet Surg J. 2007;27(2):155- 161. Tavares JP, Oliveira C, Torres RP, Bahmad F, Jr. Facial thread lifting with suture suspension. Braz J Otorhinolaryngol. 2017;83(6):712-719. Sasaki GH, Komorowska-Timek ED, Bennett DC, Gabriel A. An objective comparison of holding, slippage, and pull-out tensions for eight suspension sutures in the malar fat pads of fresh-frozen human cadavers. Aesthet Surg J. 2008;28(4):387-396.